Is there anything better than watching someone you love open a gift that has been specially crafted with thoughtful care, designed just for them? I’m not sure there is. While a child, a preschooler in particular, may not put such sentiments into what is otherwise process art, a beautiful kid made Christmas gift, like these watercolor ornaments will bring the most sincere smile to that special someone’s face. Aren’t these ornaments beautiful? 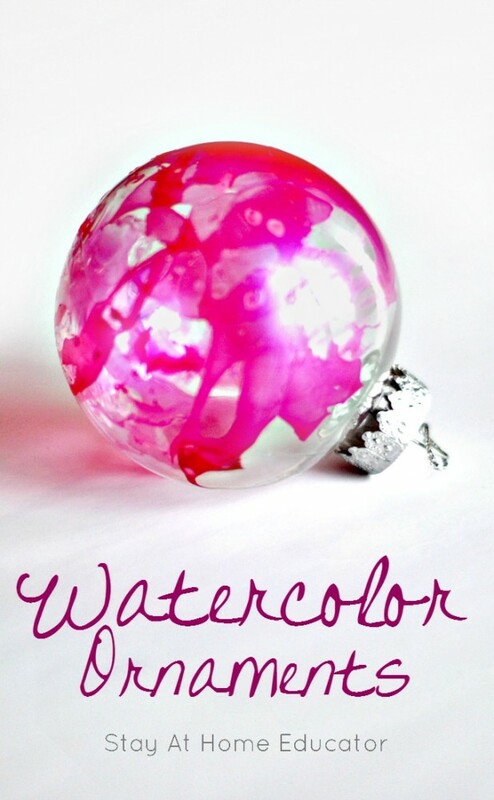 They are watercolor ornaments and they couldn’t be easier to make! While this project does need adult supervision, it’s easy enough for preschoolers, but fun enough that even older children can do it. And, best of all, it can be done on the cheap. On the serious cheap. As in, it cost me $0.50 per ornament. 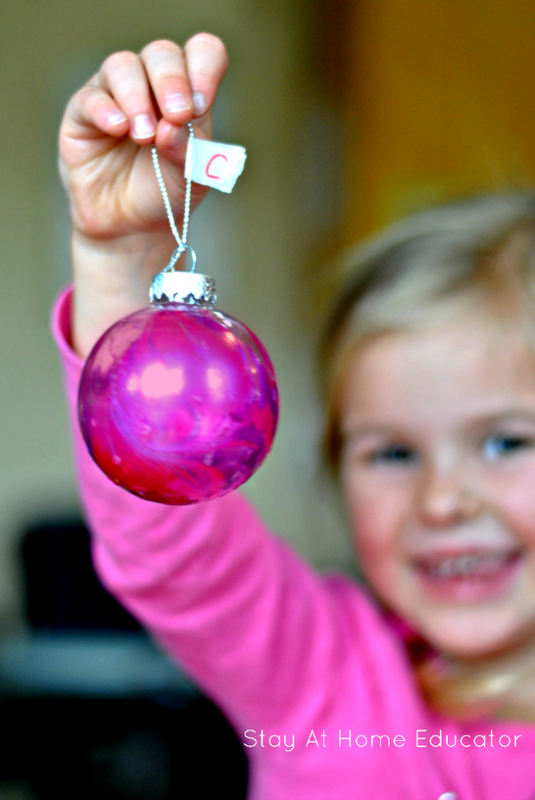 At that cost your child can make a gift ornament for all her relatives as well as her friends. And let me be completely honest, the process is kinda’ addicting. Have your seen that awesome Youtube video about how to make watercolor coffee mugs? It’s not real watercolor, but a faux technique that is crazy easy! I’ve seen a few videos, but I followed the tutorial from this one. It’s quick and simple, with clear instructions. Wacth it, and you’ll see what I mean. Easy enough for preschoolers, fun enough for older kids, right? I purchased some clear bulb ornaments from the Dollar Store, two in a pack. The nail polish I already had on hand, however next year I will buy some holiday red and green polish, and maybe some sparkly gold, just for this activity. Use warm water, not cold. The warm water helps disperse the nail polish in an even layer on top of the water. If cold water is used, the polish may sink to the bottom of the container. Use clean water with each ornament. The left over nail polish will leave a film on the top of the water, making it difficult for the new polish to adhere. Instead of dumping out the water, if it is still warm, you can simply use a toothpick to pick up the film and the water will be clean enough to dip another ornament after you’ve added new polish. Dip, and don’t turn. The first few I tried, I thought it would be best to twist the ornament as I dipped in the water, thinking I needed to turn the ornament to “paint” its round form. I was wrong. Do just as the video states. Dip straight down, then pull it out and hang it up to dry. I hung the ornaments off the light in the dining room while they dried. Wherever you hang them to dry, be sure to place some newspaper underneath just in case there is some paint thick and heavy enough to drip. (No dipping for me, though). Don’t use too much polish. In the video, you saw that very little polish was used. That is because if you use too much, it will clump on the ornament and then drip when you hang it to dry. Use a container deep enough to submerge the ornament, and make sure it is one you can throw away. After all, you are putting nail polish in this container, so you’re not going to be storing cookies in it again. 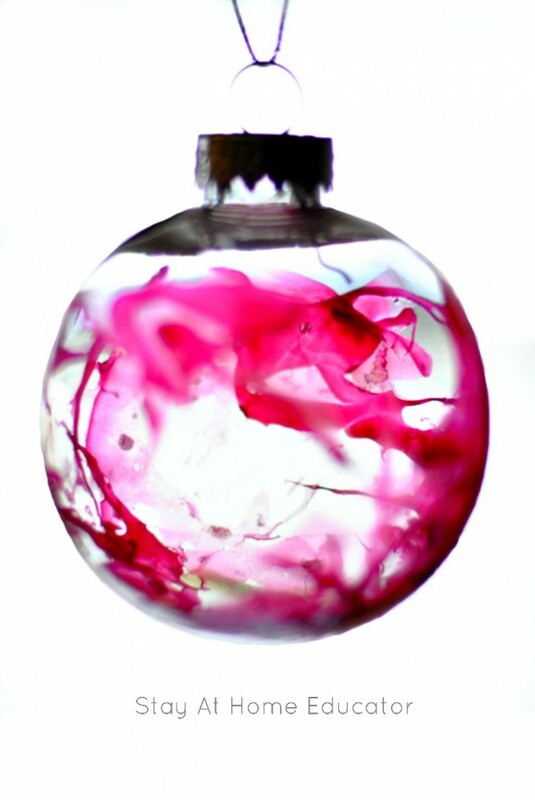 You may have to help your preschooler submerge the ornament into the water. If you give a little pressure and help them push straight down, the polish will create a perfect ring around the top of the bulb, and it will look perfect in every way. Watching someone open a gift your kid made with special care just for them. The smile on Grandma’s face, (or brother’s or auntie’s or the next door neighbor’s) will warm your heart, but the smile your child gives in response is priceless. These watercolor ornaments will do just that, which makes them the perfect kid-made Christmas gift.